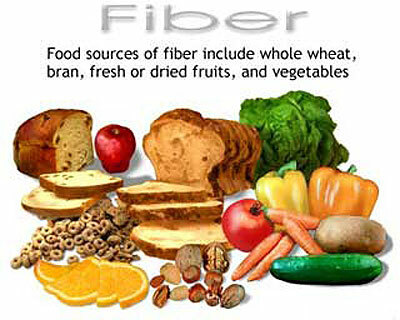 If you want to lose weight, eat a diet low in fat and high in fiber. 25 scientific studies reviewed by Drs. M. Yao and Susan Roberts of Tufts University showed that people on high-fiber/low-fat diets lost 3 times as much weight as people who ate only a low-fat diet. The American diet is high in fat a low in fiber. We eat these high-fat meals because they taste good-most people would rather eat a steak or a piece of cake than some celery. People also tend to eat more food if it tastes good. Eat foods with a high water content, such as fruits and vegetables. Include several servings of foods containing whole grains. Be wary of foods containing hidden fats-their calories can add up fast. Consider taking a fiber supplement and a glass of water about 15 minutes before each meal. The fiber will bind to the water and give you a feeling of fullness.